What Wine to Serve with Christmas Dinner - Cooking With C.C. You’ve got a great menu planned for Christmas and you’re trying to figure out what wine to serve. It can be a real challenge to try to pick wines that will go with the meal and that everyone will like. I asked Annette Burchfield of The Wine Cellar for suggestions for some wines that go well with many foods and would be crowd pleasers. The recommendations are priced between $10 and $15 per bottle. (Figured this was a good holiday budget range – more on budget later.) Here are two whites and three reds for you to consider. 2013 LaFiera Pinot Grigio – This wine comes from the Veneto region of Italy (area near Venice) and is made from the Pinot Grigio grape. This is an easy to drink crowd pleaser and goes with lots of food. The tasting notes say that the wine “expresses minerality with lovely apple and ripe peach flavors.” This wine is dry and has a lingering acidity. The price for this is $12.99 per bottle. 2013 Kung Fu Girl Riesling – This is one of the wines from the Charles Smith Wines collection from Washington State and is 100% Riesling. The grapes are grown in the Ancient Lakes wine region. The tasting notes on this one say “white stone fruit, white peach, apricot, cool and delicious. Think Fuji apple, shiro plum, lime leaves. Focused and a very long minerally finish.” This is a great vintage and was rated 90 points by Wine Spectator and Robert Parker. With a price of $13.99, this is a GREAT value! 2012 Route 152 Pinot Noir – Route 152 is made about 25 miles from Monterey Bay in the Central Coast appellation. This area has exploded in the last few years with quality Pinot Noir wines. With rugged hills, rocky soils and a cooler climate, it is perfect for growing Pinot Noir. The Route 152 is 100% Pinot Noir and aged 14 months in oak barrels. The tasting notes for this wine say “vibrant flavors of wild strawberries and raspberries, it has forward fruit with nice acidity and a subtle earthiness on the finish. An exceptional value, this well-balanced wine pairs well with a wide range of cuisine.” Priced at $12.99 this is a good value. 2010 Split Creek Merlot – This wine is also from the Monterey area. 2010 was the coolest growing season since 1998. The tasting notes on this one say “color is dark garnet and the aromas are explosive with dominant notes of wild blueberry and blackberries. The wine is supple and smooth in the mouth with beautiful, broad fruit flavors and integrated tannins. This wine will pair well with steak and beef. Priced at $12.99, another great value. There is one more Red Wine that I want to bring to your attention. This is a Washington Cabernet Sauvignon from Columbia Crest. We like to keep this one around for everyday enjoyment. Their 2012 Horse Heaven Hills Cabernet Sauvignon is a real winner – the tasting notes on this one say “This bold Cabernet opens with flavors of black cherries and blackberries with a touch of currants and vanilla, complemented by earth and mineral notes. Deep berry flavors lead to a soft tannin cocoa finish.” This wine was rated 92 Points by Wine Spectator. The H3 Cabernet is widely available – Annette stocks it at the Wine Cellar and I’ve seen it in Grocery Stores and Costco as well. Tends to be a bit more expensive in the grocery stores, but it is in the $15 range ($10.99 at Costco, $14.99 at Wine Cellar, $16.99 at Kroger). For a word on budget – you can get some wonderful wines for around $15.00, but you can also buy a lot of bad wines for $15.00 – the key is to know what you buy and if you don’t know, then get help from a wine retailer. If you are one of those that looks for wines in the single digits, take the Christmas holiday as an excuse to “splurge” on one of these wines. If you are willing to spend more for your special Holiday dinner, you can move up to top shelf wines for the $40-$60 range. For suggestions, there’s nothing like having your own wine consultant – and that’s what the staff at your local wine shop is more than happy fo do. 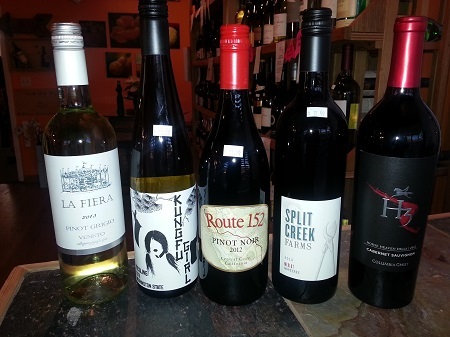 Go see Annette or any of the team at The Wine Cellar and they will find something perfect for you. If I still haven’t convinced you to “seek professional help” or spend a little more, then I like Costco for the self service crowd. Being headquartered in Seattle and surrounded by wine country, Costco was the first big box retailer to hire a Master Sommelier to build their wine retail program. A few years back, Costco began a private label wine program under the Kirkland label. I’ve tried a number of the Kirkland Signature wines and they have all been very tasty and good values. The pricing on these wines vary widely. If you are looking for single digit wines, they have several good options. One word of warning in this price range – a lot of the big producer wines are just not very good. I don’t want to embarrass anyone, but at a recent event, had a mass produced Pinot Noir that was purchased from Costco and it was not good….you need to know what you are buying. Again, there are nice wines to be found in this price range, but they are very outnumbered by bad ones. The Kirkland Sonoma Chardonnay is priced at $6.99 and is much better than the other big producers in this price range. On the red side, I’ve had two different wines – The Bordeaux Superieur for $6.99, Medoc Red Blend for $8.99 both of these are French reds. There are higher priced wines in the Kirkland brand as well that are all generally good values. Bottom line, Christmas is a time to serve some new wines at the table. I’m sure you would be happy with any of these wines. Note: There are just so many different wines to choose from – this list is very subjective and our opinions. Also, quantities may be limited on these specific wines. That’s why you need to get to know a local wine person to help you. next post: Wine Scores – Do they help or hurt?